Hemophilia is the oldest known hereditary bleeding disorder. There are two types of hemophilia, A and B (Christmas Disease). Both are caused by low levels or complete absence of a blood protein essential for clotting. Patients with hemophilia A lack the blood clotting protein, factor VIII, and those with hemophilia B lack factor IX. There are about 20,000 hemophilia patients in the United States. Each year, about 400 babies are born with this disorder. Approximately 85% have hemophilia A and the remainder have hemophilia B. 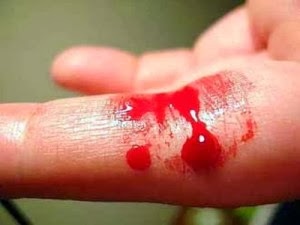 The severity of hemophilia is related to the amount of the clotting factor in the blood. 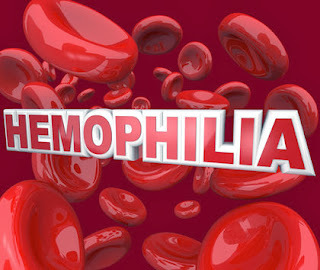 About 70% of hemophilia A patients have less than one percent of the normal amount and, thus, have severe hemophilia. A small increase in the blood level of the clotting factor, up to five percent of normal, results in mild hemophilia with rare bleeding except after injuries or surgery. Enormous strides made in assuring the safety of the blood supply and in the genetic aspects of hemophilia research allow us now to focus on issues which will improve the quality of life of the hemophilia patient and, ultimately, develop a cure. Hemophilia is a genetic disease. A defective gene located on the X chromosome causes hemophilia. Men who have the defective gene will have hemophilia since they possess only one X chromosome. Since females have two X chromosomes, they will develop hemophilia only if both chromosomes carry the defective gene. However, females are carriers of this trait and will pass on the defective chromosome to fifty percent of their offspring. Approximately one fifth of hemophilia B cases and one third of hemophila A cases occur from a spontaneous gene mutation with no family history of the disorder. In spontaneous cases such these, the gene can be passed on to offspring. Hemophilia A is more common than hemophilia B. About 80% of people with hemophilia have hemophilia A. Hemophilia B occurs in about 1 out of every 25,000 to 30,000 people. A subgroup of those with hemophilia B has the so-called Leyden phenotype, which is characterized by a severe hemophilia in childhood that improves at puberty. heavy bleeding during monthly periods (menorrhagia). unusual bleeding after injury or surgery. bleeding from small cuts that starts and stops over several hours. unusual bleeding from the mouth or gums or after a tooth extraction. Intracranial hemorrhage (bleeding into the brain or skull) can lead to symptoms such as nausea, vomiting, and/or lethargy. The platelet (a blood particle essential for the clotting process) count should be measured as well as two indices of blood clotting, the prothrombin time (PT) and activated partial thromboplastin time (aPTT). A normal platelet count, normal PT, and a prolonged aPTT are characteristic of hemophilia A and hemophilia B. Specific tests for the blood clotting factors can then be performed to measure factor VII or factor IX levels and confirm the diagnosis. Depending upon the severity of the condition, replacement therapy may be carried out on an as-needed basis (called demand therapy) or on a regular basis to prevent bleeding episodes (known as prophylactic therapy). People who have mild cases of hemophilia A are sometimes treated with the drug desmopressin, also known as DDAVP. This drug stimulates release of more clotting factor by the body. It is administered either slowly through the intravenous route (IV) or occasionally, in nasal spray form. Cases of severe hemophilia will sometimes involve a doctor giving regular factor replacement treatments (a therapy called prophylaxis - literally "preventative treatment") to prevent most bleeding episodes. Also, episodes of spontaneous bleeding can be partially controlled with regular exercise to strengthen muscles and protect joints; however, under no circumstances should such a program be undertaken without the consent and direction of a physician. Genetic counselors can make a detailed family history. They will discuss risks and available testing options. Major complications stem from the psychological impact of a chronic disease on children, adolescents, and their families to life-threatening cerebral hemorrhage. Some hemophilia patients develop antibodies (inhibitors) to the coagulation factors used to prevent bleeding. Approximately 15 percent of severe hemophilia A patients and 2.5 percent of hemophilia B patients develop such antibodies after exposure to transfused factors. When inhibitors are present in large amounts, the patient may require very high and expensive quantities of transfused clotting factors to stem bleeding, and, in some instances, even that may not be effective. The factor VIII products produced through biotechnology have been found to cause inhibitors in only about 5 percent of patients and are, thus, safer in this respect. In the absence of prophylactic therapy, now recommended to begin at one to two years of age, potentially disabling arthritis occurs in joints that have experienced hemorrhage (hemarthrosis). Pseudotumors -- cysts that arise from hemorrhage in muscle or the covering of the bone which then damage adjacent muscle, nerve, and bone -- also occur and must be excised completely to avoid recurrence. There are also life-long concerns about availability, cost, and purity of replacement factor products. Although treatment for hemophilia has become safer, therapeutic products are still not risk free. The ultimate goal is to offer a cure for the disease. Hemophilia is known to be caused by defects in the genes for factor VIII and factor IX. The challenge is to transfer normal genes into a patient so that they will produce the normal clotting protein. A small amount of active factor produced by the patient's own body will correct the disease. Although much remains to be studied before such treatment can be offered to patients, there have been a number of studies done in animals such as mice and dogs in which a factor VIII or IX gene has been inserted and has produced the proper blood product for periods that exceed one year. Major issues that remain to be resolved include the low level of production of the clotting factor, reduction of immune reactions that stop the production after a period, and development of ways to insert the gene directly into the body without manipulating cells outside the body. Until recently, dogs with naturally occurring hemophilia were used for testing of gene therapy techniques; however, the number of such animals is very limited. Recently, a mouse model of hemophilia produced through genetic technology was announced. The availability of this small animal will accelerate the development of technologies for ultimate use in humans.